Israeli navy ships opened fire, on Wednesday at dawn, on a number of small Palestinian fishing boats in Palestinian waters, near the Sudaniyya area, northwest of the Gaza Strip. Eyewitnesses said the soldiers fired several live rounds targeting at least three fishing boats, less the two miles away from the Gaza shore, forcing all fishers back to shore. The attack is part of ongoing Israeli violations to every ceasefire agreement, mediated by Egypt, and to the Oslo Accords. There are more than 3800 Palestinian fishers in the Gaza Strip, providing food to dozens of thousands of family members. Israeli attacks on Gaza fishers led to dozens of casualties, including several fatalities, in addition to dozens of arrests, while the soldiers also confiscated scores of fishing boats. 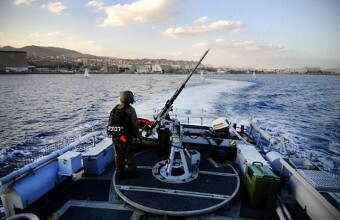 On Saturday, March 7, a Palestinian fisher was killed by Israeli navy fire, and two others were kidnapped. 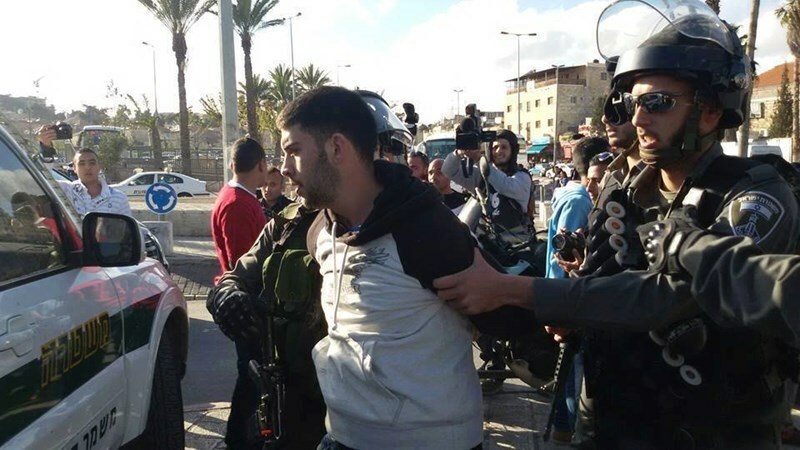 Israeli Occupation Forces (IOF) rounded up a foreign solidarity activist in the Old City of al-Khalil while quelling a peaceful march for planting olive saplings on Wednesday. 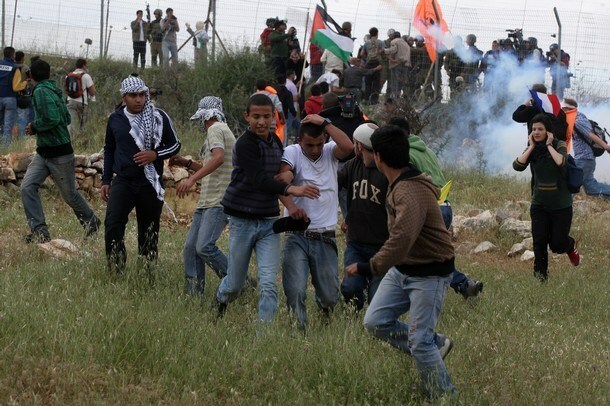 Local sources said the IOF soldiers assaulted the Palestinians as well as foreigners who participated in the activity. The IOF fired gas bombs at the participants, arrested a female foreigner and took her to an unknown destination, the sources elaborated. The sources also revealed that IOF soldiers barred the Palestinians from implanting the olive seedlings. Earlier on Tuesday, the Israeli forces attacked members of al-Sharabati family on the Land Day in al-Khalil. Israeli soldiers in nearly 20 military vehicles stormed at dawn Wednesday Jenin refugee camp and broke into a number of local buildings which led to the outbreak of violent clashes. A live bullet injury was reported during the clashes. The Israeli Occupation Forces (IOF) escorted with police dogs have violently raided homes belonging to the brothers and relatives of Sheikh Bassam Saady who is still hunted for being affiliated with Islamic Jihad Movement, eyewitnesses said. A number of neighboring buildings were also stormed and violently searched in the camp. The IOF soldiers also filmed the stormed buildings using their mobile phones after conducting field investigation with the homes’ owners. Shortly after the Israeli raid, violent clashes erupted between Israeli forces and local residents. A 22-year-old young man was shot and injured in his leg with a live bullet during the clashes. He was then transferred to hospital in moderate situation. 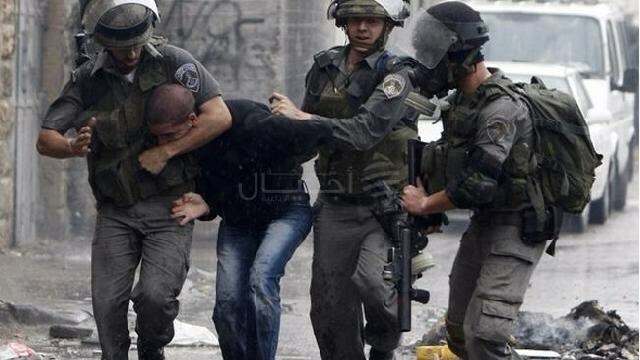 Two young men were nabbed after IOF soldiers broke into their homes in the refugee camp. On the other hand, similar clashes broke out in Arqeh town in northern Jenin during which tear gas bombs were heavily fired. 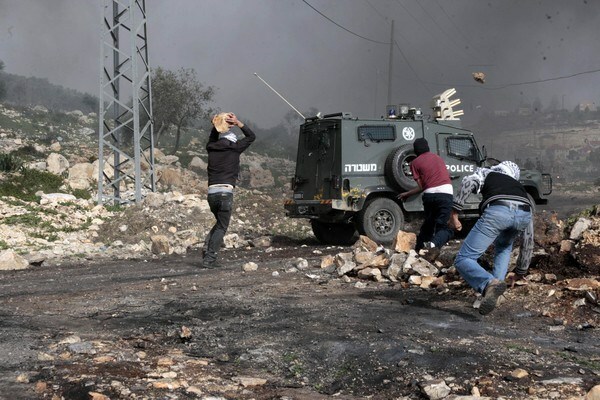 The clashes erupted when Israeli forces broke into the town at dawn today. Several injuries were reported among the residents, local sources told the PIC reporter. One Palestinian was shot and injured by Israeli army fire after the soldiers invaded, on Wednesday at dawn, the Jenin refugee camp, in the northern West Bank city of Jenin; the army also kidnapped two residents, and detained three. Medical sources in Jenin said a young Palestinian, identified as Ahmad Salim an-Nourasy, 19, was shot by a live round to his right leg, causing a moderate injury. Media sources said clashes took place after the soldiers invaded the camp, and that the soldiers kidnapped two Palestinians, identified as Ahmad Tawfiq Qreini, 21, and Abdul-Karim Abu al-Fouz, 19. In addition, soldiers detained Khawla Issa ad-Damj, 42, Tareq Issa ad-Damj, 31, and his brother ‘Ammar, 19 years of age, and used them as military shields for the duration of the invasion. The three were released before the soldiers withdrew from the camp. In related news, many Palestinians suffered the effects of tear gas inhalation, after several Israeli military vehicles invaded the al-‘Arqa village, west of Jenin, and clashes with local youths. 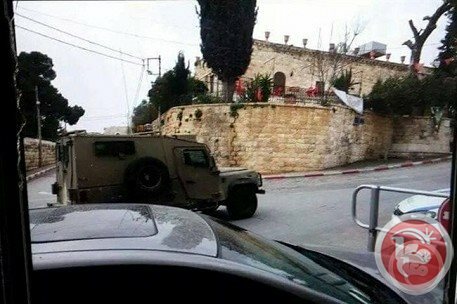 Also on Wednesday, soldiers kidnapped four Palestinians in the southern West Bank city of Hebron, and one near the northern West Bank city of Qalqilia. The Israeli Occupation Forces (IOF) fired on Tuesday evening artillery shells at Palestinian homes near Kissufim military site east of the Qarara town north-east of Khan Younis in southern Gaza Strip. No casualties were reported during the attack, local sources said. Israeli media sources claimed that the Israeli attack came few hours after Palestinian gunmen shot at Israeli troops stationed on the eastern border of the Gaza Strip. 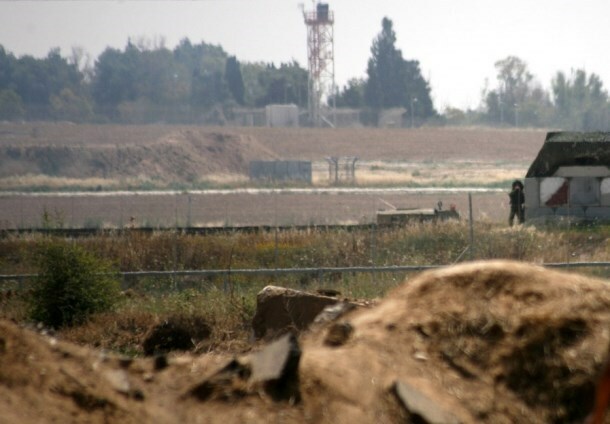 Armed Gazans have allegedly fired several rounds at the Israeli troops deployed to the north of Kissufim military site to the south of the besiege Strip, the sources added. The alleged attack resulted in no injuries, according to the sources. Earlier Tuesday, Israeli forces opened their machinegun fire at Palestinian farmers near the border fence. Israeli Occupation Forces (IOF) stormed at noon Tuesday the house of MP Mohammad Abu Juhaishe, member of the Change and Reform Bloc in the Palestinian Legislative Council (PLC), in Ithna town in al-Khalil. MP Abu Juhaishe told the PIC reporter the IOF soldiers in several military jeeps stormed his house and office at noon and started provocatively questioning him inside his house for more than an hour. He added the soldiers stayed more than two hours surrounding his house; they stopped the passersby and questioned them on the field. Then, they handed his nephew a summons to be questioned by the Israeli intelligence in Etzion. The PLC deputy, meanwhile, noted that the PA intelligence had released his elder son, Muath, from custody on Monday night after eight month imprisonment. He opined that the IOF raid into his house is a continuation of the mutual role of the IOF and the PA against him and his sons whom all were subjected to arrests for tens of times. 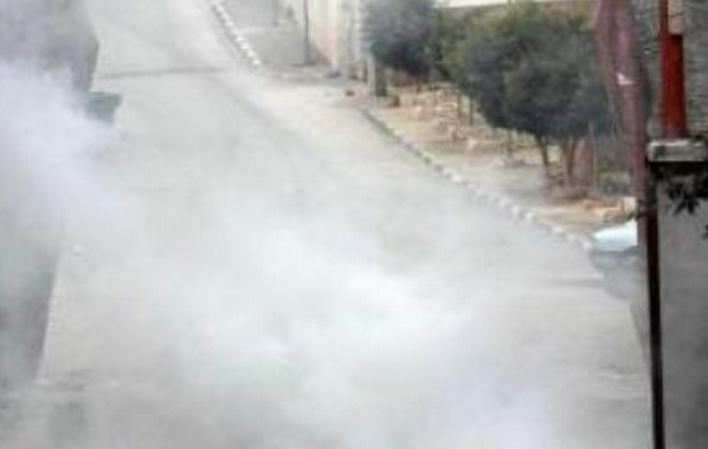 Israeli soldiers invaded, on Tuesday morning, the Teqoua’ town, east of the West Bank city of Bethlehem, and fired gas bombs causing many schoolchildren to suffer the effects of tear gas inhalation. Eyewitnesses said the children were walking to school when the soldiers stormed the village, especially since their schools are on the main road. Fearing the army, the children tried to run away and avoid direct contact with the soldiers, but the soldiers fired several gas bombs, and concussion grenades, causing many to suffer the effects of tear gas inhalation. On Monday evening, Israeli sources said a soldier was injured near Beitar Illit illegal settlement, south of Bethlehem. The sources said one soldiers was struck in the forehead by a stone thrown by one of the protesters, and suffered a mild injury. Israeli policemen afternoon Monday rounded up three Jerusalemites, including a young lady, as they violently disbanded a peaceful demo commemorating the Land Day in Bab al-Amoud, in Occupied Jerusalem. A PIC correspondent said a wave of clashes broke out as the policemen brutally dispersed the demonstration, targeting the non-violent rally-goers with randomly shot spates of stun grenades. An unidentified Palestinian young girl along with journalist Marwa Abeid reportedly sustained injuries in the assault. The rally was staged by the popular youth movement in Occupied Jerusalem to mark the 39th anniversary of the Land Day—an annual commemoration of the six Palestinians killed during a march staged in response to the Israeli government's announcement of a plan to expropriate thousands of dunums of land in the 1948 occupied territories. 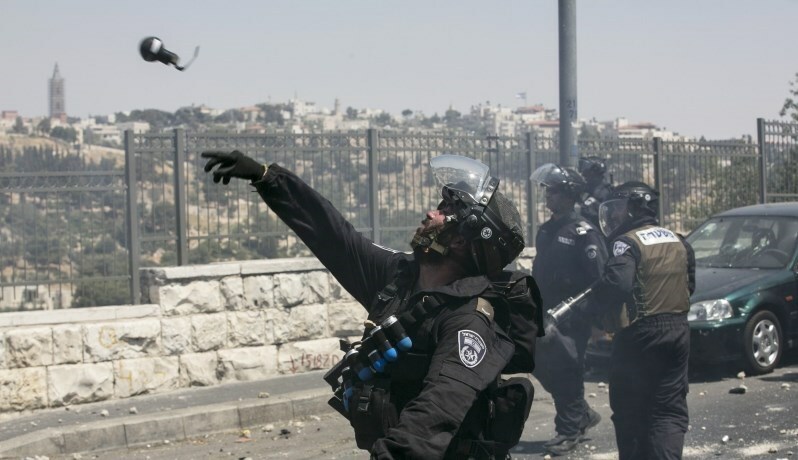 About one hundred Palestinians were left wounded and hundreds of others arrested in the ensuing clashes. The Israeli police, meanwhile, have remained on high alert and propped up police reinforcement across Jerusalem, particularly at Bab al-Amoud. A group of Palestinian youths managed to get back to Bab al-Amoud area, after the policemen aggressively disbanded the rally-goers, and chanted national slogans and songs. On Land Day anniversary, Palestinian activists managed to plant dozens of olive trees in a land threatened with confiscation to the south Jenin despite the heavy presence of Israeli occupation forces (IOF). Local sources said that a number of Palestinian youths planted olive saplings in a land threatened with confiscation over the past four years in Jenin’s town of Arraba. 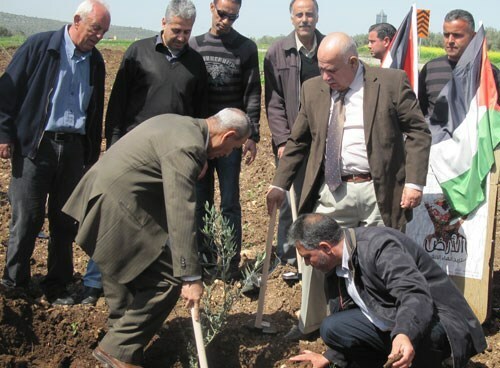 Arraba mayor Ahmed Aradaa said that planting the seedlings proves the Palestinians’ strong adherence to their land. He stressed the need to provide protection to the lands threatened with confiscation. In Gaza Strip, the Israeli Occupation Forces (IOF) opened fire at dozens of youths near the border fence east of Khan Younis in southern Gaza Strip as they were commemorating Land Day anniversary. Dozens of Palestinians rallied on the Land Day and marched towards the border fence east of Khan Younis, before setting fire to a number of tires. The participants chanted slogans against the occupation and managed to place Palestinian flag on the fence before IOF soldiers opened their machineguns at them. No casualties were reported. On the annual Land Day, demonstrations are held to remember six Arab protesters who were shot dead by Israeli police and troops during mass demonstrations in 1976 against plans to confiscate Arab land in the Galilee. 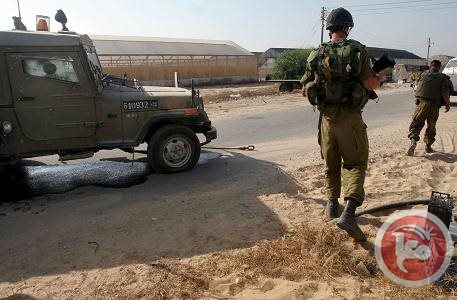 Three Palestinians where shot and injured by Israeli forces in Khan Younis in the southern Gaza Strip, a medical official said Monday. 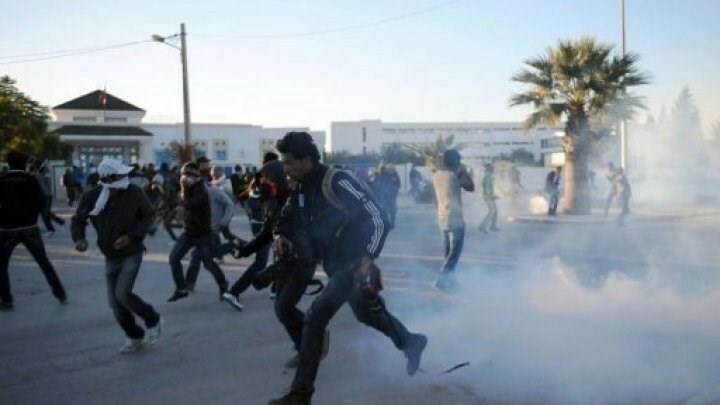 Ministry of Health spokesman Ashraf al-Qidra said two youths were shot east of Khan Younis and were taken to the European Hospital for treatment of moderate injuries. A third Palestinian was shot earlier in the Absan area east of Khan Younis, where Israeli forces opened fire and shot tear gas at Palestinians, witnesses said. An Israeli military spokeswoman said Israeli forces fired toward one Palestinian who she called a "main instigator" of a violent riot in southern Gaza. She said Palestinians rolled burning tires and hurled rocks at troops. Forces fired warning shots before aiming at the participants' lower extremities, she added. The incident came the same day as Palestinians across the West Bank and Gaza took part in marches to mark the 39th anniversary of Land Day, commemorating Palestinian protests against Israeli land seizures that were violently suppressed on Mar. 30, 1976. Marches in Gaza were called for by coalition group the National and Islamic Forces, which called for political unity to end the suffering of Palestinians across the occupied territories as well as an end to the Israeli-administered blockade of the Gaza Strip. The group also used the opportunity to call on the Palestinian political leadership to seek full Palestinian membership at the UN. 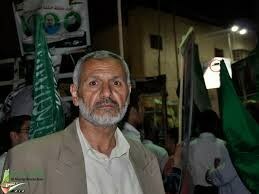 Also participating in the march were Islamic Jihad, the Popular Resistance Committees and the Palestinian Arab Front. In a statement, the Islamic Jihad movement said that armed resistance was the only means toward ending the Israeli occupation, adding that the Israel-Palestine conflict would not end until "every inch of land in Palestine" had been freed. The Popular Resistance Committees, meanwhile, said that all differences among Palestinians should be put aside in order to face Israel and fight Israeli policy of confiscating Palestinian land and building illegal settlements. The West Bank saw thousands take to the streets in commemoration of Land Day, despite Israeli attempts to suppress protests. In the village of Huwwara in southern Nablus, Israeli forces attempted to suppress a march in which more than 2,000 Palestinians took part. More than 15 Palestinians suffered tear-gas inhalation, including Fatah member of the Palestinian Legislative Council Walid Assaf. Other Palestinian leaders taking part in the march included Mahmoud al-Aloul, a member of Fatah's Central Committee, Qais Abd al-Karim, member of the Democratic Front for the Liberation of Palestine's politburo, and MP Mustafa al-Barghouthi, among others. Witnesses said that hundreds of Israeli soldiers were deployed. In Silwad in northeastern Ramallah, several more Palestinians commemorating Land Day suffered tear-gas inhalation when Israeli forces suppressed a march. Israeli soldiers reportedly assaulted protesters, firing tear-gas canisters, stun grenades and rubber-coated steel bullets, and targeted journalists covering the march. Witnesses also said that they fired tear-gas canisters at an elementary school, despite dozens of children still being inside the school. PLO Executive Committee member and PFLP leader, Abd al-Rahim Maluh, said: "commemorating Land Day demonstrates that Palestinians are loyal to martyrs, prisoners and the wounded." Israeli Occupation Forces (IOF) suppressed at noon Monday a Land Day commemoration rally that took place in a town to the west of Bethlehem. The PIC reporter said the IOF suppressed a march organized by Palestinian activists to plant olive trees in Wadi Fukin lands threatened with confiscation. The reporter added that hundreds of participants from all over Bethlehem including refugee camps gathered in the town’s center and marched toward the lands threatened with confiscation. The marchers waved Palestinian flags and carried olive seedlings in addition to simple planting tools. Large numbers of IOF troops showered the march with tear gas bombs leading to dozens of suffocation cases among the marchers. Wadi Fukin is surrounded by four settlements from its various entrances. The IOF along with Jewish settlers deliberately tighten the noose on its inhabitants in order to force them to abandon their lands. Dozens of Palestinians suffered breathing difficulty due to the Israeli brutal suppression of a peaceful march on the Land Day in Hawara town to the south of Nablus city at noon Monday. Eyewitnesses told the PIC reporter that more than 20 participants including MP Walid Assaf suffered breathing problems because of the Israeli occupation forces’ intensive firing of gas bombs and stun grenades at the marchers. The injuries ranged between minor and moderate. The eyewitnesses reported that the ambulances along with medical teams rushed to the scene to transfer the injured. The IOF soldiers, however, tried to obstruct their arrival. The IOF soldiers hampered the work of pressmen as well and closed several shops in the town, the sources added. Hundreds of Palestinians took to the streets to commemorate the occasion of Land Day in a march called for by the Palestinian national factions and parties. The marchers chanted slogans, raised the Palestinian flag, and waved banners stressing the Palestinian right to their own land. The banners also called for resisting the Israeli occupation and settlement building. A Palestinian young man from Yatta town to the south of al-Khalil city sustained injuries and bruises at dawn Monday after being assaulted by the Israeli Occupation Forces (IOF). Local sources said the IOF soldiers chased some of the Palestinian workers who work inside the 1948 Occupied Palestine and assaulted the young man called Thair al-Qaymari from Yatta by brutal beating that led to injuries and bruises. The young man was transferred to hospital for treatment. The IOF campaigns of chasing Palestinian workers in the 1948 Occupied Palestine are increasing, the sources pointed out. Palm Sunday celebrations in Beit Jala were brought to an abrupt end, on Sunday, when Israeli troops raided the majority-Christian town near Bethlehem and began threatening locals. Palestinian policemen on duty near the celebrations were threatened by Israeli soldiers with arrest during the raid, which took place in the middle of the day as Sunday mass was coming to an end in local churches, Ma'an News Agency reports. The town of Beit Jala is subject to regular incursions by Israeli forces, even though the large majority of its population live in Areas A, subject to full Palestinian civil and military control under the Oslo Accords. Palm Sunday is celebrated this year on March 29 according to the Gregorian calendar, which is recognized for religious purposes by most Western Christian denominations in Palestine. Orthodox Christians, meanwhile, use the Julian calendar and will be celebrating Palm Sunday on April 5. The raid raises fears of a repeat of last Easter, when Israeli restrictions on Christian worship during the holiday prevented thousands of Christian Palestinians from traveling to Jerusalem and led to chaotic scenes in the city itself. Israeli authorities have in the past come under sharp criticism for the violation of religious freedom of Palestinian Christians, who number around 200,000, including 50,000 in the West Bank, 1,000 in Gaza, and the rest inside Israel. In March of last year, Christians from East Jerusalem issued a statement complaining that Christians are often denied access to the Church of the Holy Sepulcher during the Easter holidays. Each Easter, checkpoints are erected "at the Gates and in the alley, thus preventing the worshipers from free access to the Via Dolorosa, the Church of the Holy Sepulcher, and the vicinity of the Christian Quarter." A report published by the US State Department in 2012 made similar observations, stating: "Strict closures and curfews imposed by the Israeli government negatively affected residents' ability to practice their religion at holy sites, including the Church of the Holy Sepulchre and Al-Aqsa Mosque in Jerusalem, as well as the Church of the Nativity in Bethlehem." It added: "The separation barrier significantly impeded Bethlehem-area Christians from reaching the Church of the Holy Sepulchre in Jerusalem and made visits to Christian sites in Bethany (al-Eizariya) and Bethlehem difficult for Palestinian Christians who live on the Jerusalem side of the barrier." Following Easter celebrations in Jerusalem in 2013, Hanna Amireh, head of the Presidential Committee on Church Affairs, said, "The Israeli forces turned a religious occasion into a battle camp scenario." The Israeli navy Sunday targeted Palestinian fishermen with gunfire while they were sailing offshore the city of Gaza, according to a WAFA correspondent. He said the navy fired heavy gunfire towards Palestinians’ fishing boats despite sailing within the six-nautical-mile zone allocated to fishing activities at four nautical miles. The fishermen returned to the shore quickly to escape the attack. There were no reports of casualties, however. On March 7, Israeli naval boats opened heavy gunfire on fishermen sailing within the allowed zone six-nautical miles, killing fisherman Tawfiq Abu Rayyala, 25, who was shot with a bullet in the abdomen before succumbing to his wounds in a local hospital. Israeli navy and army routinely open fire on Palestinian fishermen sailing within the six-nautical-mile zone, as well as farmers in farmlands along the border. Israel and the Palestinian factions signed a ceasefire deal on August 26, ending the 2014 summer Israeli onslaught on Gaza that claimed the lives of over 2,200 people, overwhelmingly civilians. Under the terms of the ceasefire, Israel was to immediately ease the blockade imposed on the Gaza Strip and expand the fishing zone off Gaza's coast, allowing fishermen to sail as far as six-nautical-miles off shore. Israel has however failed to do so, repeatedly violating the ceasefire deal through opening fire on Palestinian fishermen within the fishing zone and reducing their intake. Israel has imposed a blockade on Gaza after Hamas won the parliamentary elections and ascended to power in 2006. The blockade was tightened after Hamas’ subsequent takeover of the coastal enclave from Palestinian Authority's security services in 2007.